With its pastoral farm setting, Featherstone Center for the Arts has served as a unique public center for art education. Featherstone Center for the Arts still closely resembles the family farm that preceded it, with rolling pastures and old barns that bring to mind a quiet mountain village. On a recent afternoon, visitors came and went through the open door of a gallery that looked out over a field where a cow and her calf lounged in the sun. Inside the small pottery studio — a former breeding barn for ponies — people sat at the wheels, engrossed in their work, or dabbed glaze onto their mugs and sculptures. Farther up the hill, a series of printing presses sat quietly in an old stable. For 20 years, Featherstone has offered a home for Island artists, making the most of its old barns and stables. But with a major donation this summer and a campus straining under its own age and popularity, the center is looking toward the future. A master plan for the property includes a new pottery studio and art barn, and the renovation of existing buildings on the six-acre property. 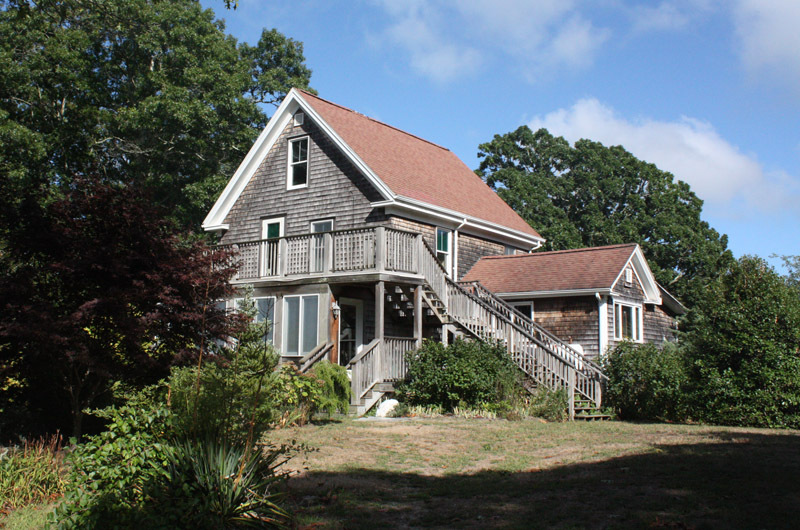 Plans for a new pottery studio earlier this year bypassed review by the Martha’s Vineyard Commission. But a $2.89 million anonymous donation in July has propelled the project forward, and the commission is now reviewing plans for both the pottery studio and new art barn. The center hopes to complete both projects by next June. The donation also launched the public phase of a fundraising campaign, bringing the nonprofit more than halfway to its goal for the $2.7 million campus project. Of the $2.89 million donation, $1 million will go toward the new art barn, $1 million adds to the center’s endowment, and $899,000 endows the executive director’s salary. Planning began about five years ago, driven by feedback from students, teachers and others who saw room for improvement at the old farm. The biggest concern was space, she said, noting that the most popular studios were built for horses, not art making. 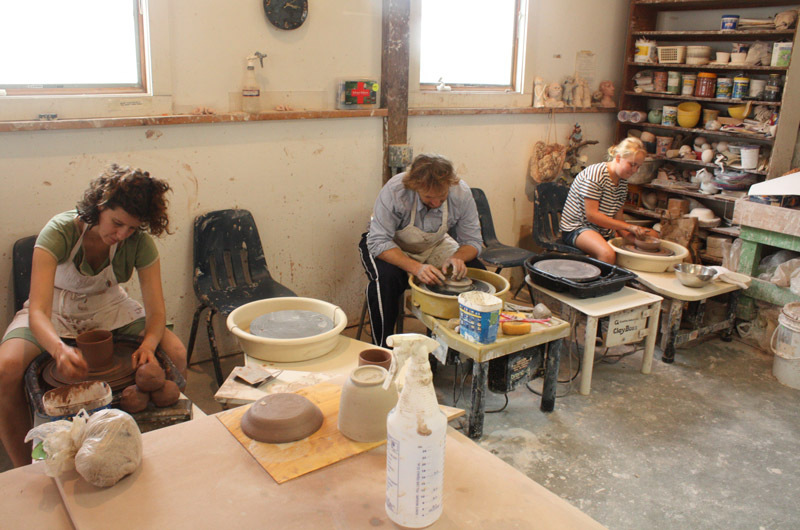 The new pottery studio will offer nearly triple the space of the original, which will likely be adapted for fiber arts as part of the future renovations. And the current art barn, which gets the heaviest use, will be replaced by one twice the size, with classrooms, offices, a large gallery and a kitchen. The master plan also features the creation of spaces designed for specific mediums, such as printmaking, drawing and photography. 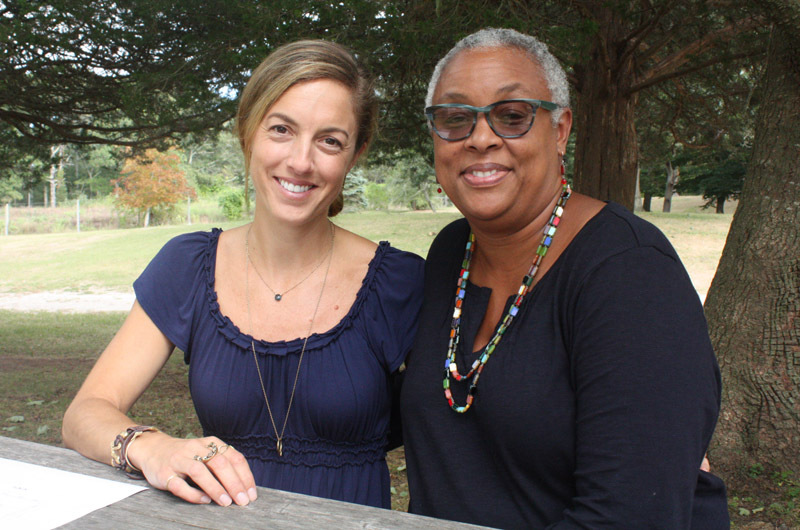 Future plans include adapting the original farmhouse for photography and film, and renovating a building known as The Studio (formerly used by cofounder Mary Stevens and her daughter Sharon, who lived on the farm) for printmaking. The lower level is used as a children’s studio. Posie Haeger, Featherstone’s director of development, said the master plan aims to preserve the pastoral landscape that helps set Featherstone apart and allows for concerts and other outdoor events in the summer. She noted the pink ribbons marking a stand of cedars where she sat with Ms. Smith at the picnic tables. But for the most part, the rural landscape will remain intact. At the base of the hill leading up to the buildings, a large pile of wood sat waiting in front of the outdoor kiln that Sharon Stevens built years ago, and which is still fired up once a year for the public. This year’s firing is scheduled for Sept. 23 to 25. The master plan will not affect the kiln, although several other small structures will come down, including a former caretaker’s cottage and outbuildings to make room for the new pottery studio. A 10-foot-square chapel, donated by the Rev. John Schule of Edgartown, will stand at the far edge of a field behind the new art barn. The site was marked with stakes and blue ribbons, while a quiver of other stakes marked with “Art Barn” leaned against a big tree at the edge of the field. Plans were reshuffled this year when the center learned that a 50-foot buffer was required around a protected special way that runs through the middle of the campus. As a result, the new pottery studio was cited farther up the hill, and an earlier plan to simply expand the existing art barn was scrapped in favor of a new structure. Removing the cottage and outbuildings, along with a small parking area, will also enhance the special way. Plans include four parking spots beside the new pottery studio. The project returns to the MVC this Thursday following an upbeat a public hearing last week. The center has agreed, among other things, to install denitrifying septic systems for the farmhouse, art barn and pottery studio, and possibly other buildings, depending on whether the total water usage exceeds 152,397 gallons per year. The project is on a relatvely fast track, at least partly out of necessity since work cannot extend into the summer. 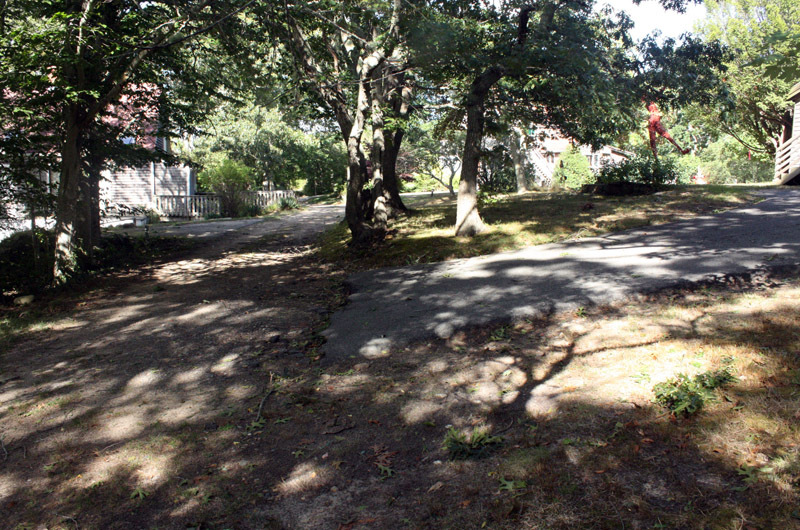 Squash Meadow Construction of Oak Bluffs is the general contractor for the project. A modular design by Westchester Modular Homes Inc. of Wingdale, N.Y., will help save time and money, although the gallery portion of the new barn will be built onsite to allow for higher ceilings. Ms. Smith said that while the buildings may change, the center itself will continue operating as it always has, with small classes, one-on-one instruction, and programs open to the public year-round. She agreed the changes will likely draw new visitors, but sees that as only a side effect of the project. I'd hope they would keep the old barn and stalls, as My Daughters and myself and many other Islanders remember with fond memories riding Horses with Ann Bannerman in both that old ring,and on the trails,and wish it had remained a horse farm.All our old favorite horses sleep forever beneath the soil there.Rest in peace old Lazzerus,Commador,Chu Chu,Major,Tia,Tara, and the others, where ever you are,we remember. Renovations sound great but modular buildings don't. It would be very sad to see this wonderful property, with all of its worts and wrinkles, turned into some over done affair. Please be the stewards you were entrusted to be and keep the Farm's essence intact. As one of the premier properties and facilities on this island, I guarantee that the board and director and planners will do ONLY what is appropriate in keeping Featherstone the treasure it is. Modular is not some lesser visual approach to the history and land, but, probably a cost necessity. With the devoted and fine attention to detail, Featherstone will only be more beautiful, more accommodating to the island, the enriching place it is....modular or not. How lucky the Island is to have Featherstone.